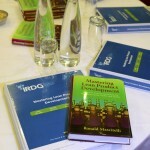 The week of May 20th, IRDG took to the road in earnest. As we hosted our visitor from California, Ronald Mascitelli, we toured the highways and byways to undertake the daily workshops. Visiting Cork, Galway, Dublin and Belfast, the tools and techniques of Mastering Lean Product Development were imparted daily to eager audiences keen to make a difference to their work. We received an overwhelmingly positive response to the workshops, and there is a significant appetite amongst the membership and beyond to implement the tools and techniques learned. As such, there now exists a ready-made community of people who have a basic knowledge of the tools and techniques and could work together to ensure implementation. We have booked 2 separate dates in June which are available for the first webinar (note these are repeats of each other), running for max 90 minutes. We can add additional webinars if demand exists. Registration details for these webinars have already been sent by email to all workshop attendees. We have received a number of enquiries from member companies who are interested in participating in a Special Interest Group (a networking group) on this topic. These companies would like to have a forum where, through conference calls and/or occasional face to face meetings, they could collaborate with other companies, share experiences and practices, and ultimately help each other to implement the tools and techniques learned in the workshops. An online LinkedIn group could provide a more informal, but equally effective method of communicating across companies. We invite companies interested in exploring this area to contact us further.